Dirk Nowitzki and the Dallas Mavericks captured their first NBA championship Sunday with a 105-95 win over the Miami Heat — the team that denied Dallas the title five years ago. 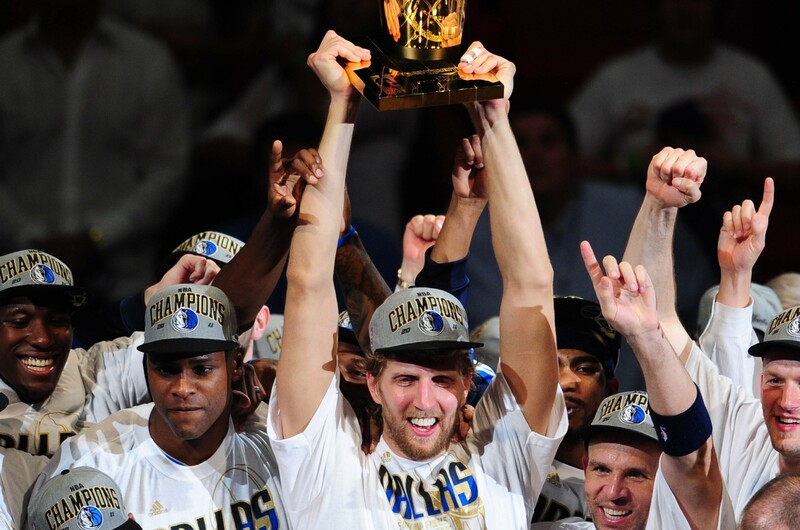 Jason Terry scored 27 points and Nowitzki finished with 21 points and 11 rebounds as the Mavericks won the best-of-seven championship series four-games-to-two. Germany’s Nowitzki was named Most Valuable Player of the finals, finally earning the NBA’s biggest prize to secure his place among the NBA’s greats. Terry ran the clock down in the final minute then passed to a wide open Shawn Marion who chose not to shoot as the seconds clicked down. When the buzzer sounded Marion handed the ball to 17-year veteran guard Jason Kidd who tried twice before in the finals with the New Jersey Nets but failed to get a ring. “Everybody wrote us off but ourselves,” Kidd said. “No matter how old you are we understood how to play the game. Kidd and J.J. Barea combined to finish with 24 points and 13 assists for the Mavericks, who clinched their first NBA championship in their 31-year franchise history. LeBron James scored a team-high 21 points and Dwyane Wade finished with 17 points, eight rebounds and six assists for the Heat, who failed to send the series to a decisive seventh game despite having home court advantage. This year’s final was a rematch of the 2006 NBA Finals, which Miami took in six games for its first title in franchise history. With Terry having a superb start to game six, the Mavericks led 53-51 at the end of the first half in what began as a game of runs by either side. Terry came off the bench to score 19 points in the first two quarters on eight-of-ten shooting. James had his best start of the series by scoring nine points and dishing three assists in the first quarter. But he never did get the synergy going with his fellow superstars Wade and Chris Bosh, who finished with 19 points in game six. “It hurts of course,” said James, who made his first four field goals of the contest. Tempers flared halfway through the second quarter when the Mavericks’ DeShawn Stevenson and Miami’s Udonis Haslem got into a shoving match. Haslem was celebrating an Eddie House three pointer when he brushed past Stevenson who shoved him. The Heat players came charging off the bench and Mario Chalmers made a bee line for Stevenson. Chalmers, Haslem and Stevenson all received technicals but no one was thrown out because a timeout had already been called before the players left the bench. Nowitzki struggled early Sunday, scoring just a single point in the second quarter, and finishing with three points on one-of-12 shooting in the opening half. But once again he finished strong by scoring 10 of his 21 in the fourth. “He goes one-for-12 in the first half and then in the second half he was just absolute money,” Carlisle said. Dallas’s Ian Mahinmi, of France, nailed a buzzer-beating field goal at the end of the third to give the Mavericks a nine point lead at 81-72. Dallas got their own rebound and Terry ran down the clock and then pump faked James before slipping a short pass over to Mahinmi who got nothing but net. The Heat had almost twice as many free throw chances as the Mavericks but hit just 60 percent of them. They also had 16 turnovers. Although the Mavericks had several players in foul trouble in the fourth, they built their biggest lead of 13 points in the final period.